Come and watch Jennifer’s lively Belly Dance entertainment in Orlando, Florida or book her to perform at your wedding or birthday party! 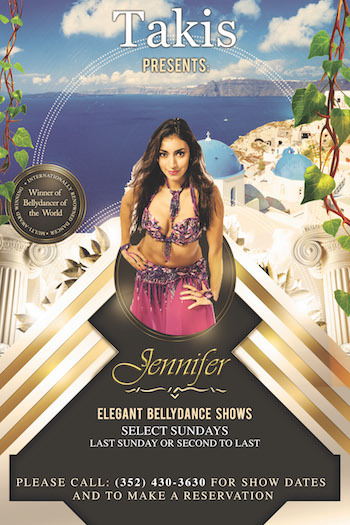 Not only does Jennifer perform at private events all around the country, but she also provides bellydance entertainment in Orlando, FL at restaurants, lounges, private residences and, conventions. Please view the schedule below to find out the available show times and dates. If you would like to hire Jennifer for your event, please email or call her at (407) 900-8397 and visit her HIRE page. Address: Takis Greek & Italian Restaurant13761 N US Hwy 441. The Villages, FL 32159. Reservations: Contact Takis Greek & Italian Restaurant to reserve your table today! What if Jennifer is Already Booked on my Desired Date? No worries, if there is ample time between her first show and your event, then she can happily accommodate both. This is quite common, but it does require planning and ample time in between. If there is not enough time between show times, she will refer you to one of her trusted award-winning dancers to ensure you have great entertainment at your event and do not have to stress or spend time trying to decipher who is at a high level or not. I want you to dance at my restaurant! Thank you so much for thinking of me. The best way to see if we will be a good fit is to contact me and from there we can go over restaurant dates and rates. I have a limited schedule but can accommodate 1x or 2x a month contracted shows. If you need more availability I book girls for venues and can happily provide you with more options for party entertainment in Orlando, FL. Jennifer is the best bellydancer we have ever seen! She just keeps getting better and better!